Sri Lanka's prime minister defeated the country's former strongman in parliamentary elections, according to results released Tuesday, blocking a key step of his bid to return to power seven months after he lost the presidency. Prime Minister Ranil Wickremesinghe said a majority of the people had endorsed what he called his administration's good governance and consensual politics in Monday's elections. 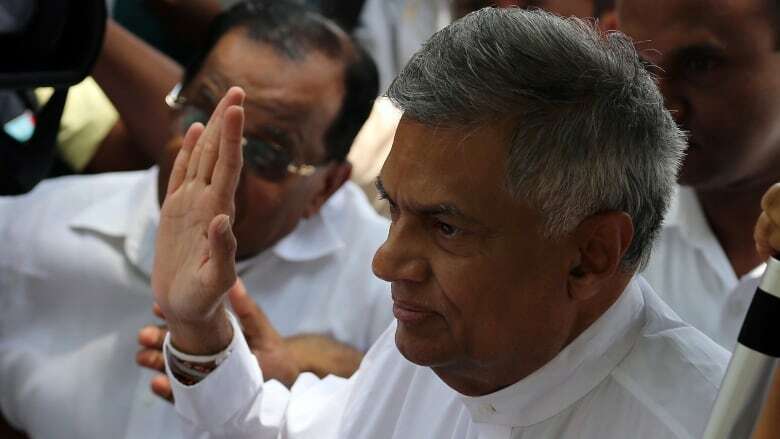 "I offer my grateful thanks to all parties and individuals who worked untiringly during the election period to ensure victory for the people," Wickremesinghe said in a statement. Official results showed Wickremesinghe's United National Party won 106 out of 225 seats in Parliament, while former president Mahinda Rajapaksa's United People's Freedom Alliance secured 95. Rajapaksa was attempting a comeback to power after his shocking loss to a former ally, Maithripala Sirisena, in January's presidential election. He was aiming to become prime minister, a position that could eventually elevate him back to the presidency. However, Rajapaksa must be content now with being an opposition lawmaker. The Tamil National Alliance swept the ethnic Tamil-majority northern and eastern provinces with 16 seats in Monday's balloting. Smaller parties won the remaining seats. A political party or a coalition must have at least 113 seats to be able to form a government, meaning Wickremesinghe will have to seek some support. Rajapaksa was Sri Lanka's president for nine years until his Jan. 8 election defeat. Rajapaksa loyalists compelled an unwilling Sirisena to nominate him for the election, but Sirisena had vowed not to appoint Rajapaksa prime minister even if he won a majority. The prime minister acts for the president when he is absent and replaces him if he is impeached, incapacitated or dies. The president has wide executive powers and usually holds the defence, foreign relations and sometimes finance portfolios. The prime minister heads lawmaking and has some governance powers. Sirisena defected from Rajapaksa's government and formed an alliance with Wickremesinghe to defeat Rajapaksa in the presidential election. He accused Rajapaksa of misrule, corruption and nepotism. Rajapaksa did not immediately comment on his defeat. Since his presidential loss, there has been a sharp reversal of fortunes for Rajapaksa, his family and friends, who were once all-powerful controllers of the island nation. Some now face investigations or lawsuits on allegations of corruption, misuse of power and even murder. Elections Commissioner Mahinda Deshapriya said Monday's elections were incident-free, other than some minor complaints. Rajapaksa was hailed a warrior king for defeating Tamil Tiger separatists to end a nearly 26-year civil war. But he is accused of using his popularity to take control of Parliament, the courts, the armed forces and all government institutions. He was also accused of widespread human rights abuses and of suppressing freedoms. Rajapaksa had been seeking to prolong his rule after abolishing a two-term limit for presidents when he lost in his attempt to win a third term.